Under relatively rare conditions of heavy precipitation, the strength of hydrometeor returns can excede that of the (desired) clear-air returns at low altitudes. Sometimes the downward velocities of the hydrometeors are so large, and persist for such a short time, that the signals are rejected by the time-continuity (reliability) algorithm of versions 1 and 2. However, in the altitude regions where the hydrometeors are just beginning to accelerate downwards (e.g. below 5 km, between 21 and 22 UT, and below 3 km just before 24 UT in the example above), the signals can be accepted. Sometimes both the hydrometeor and clear-air returns are identified as belonging to a single, broad signal. Either way this sort of contamination tends to give rise to large downward vertical velocities and enhanced (beam-broadening corrected) spectral widths in the quick-look plots. This problem also affects version-0 data products. 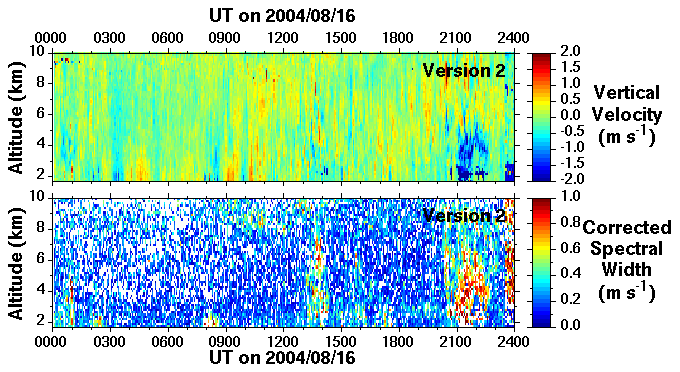 The version-3 signal processing (for which data products are due to be made available in early 2005) has been designed to provide better discrimination between clear-air and hydrometeor returns. Nevertheless, hydrometeor contamination is sometimes very hard to avoid. McDonald, A. J., Carey-Smith, T. K. , Hooper, D. A., Fraser, G. J., and Lublow, B. P.: The effect of precipitation on wind-profiler clear air returns, Ann. Geophys., 22, 3959 - 3970, 2004.